Extended droughts has resulted in the lowest water level at Lake Mead since the largest reservoir in the U.S. was filled in the 1930s when Hoover Dam was built. Lake Mead declined to 1,074 feet above sea level on May 19, 2016, below a previous record set on June 25, 2015. The U.S. Bureau of Reclamation (BOR) recorded a high water line of 1,229.0 feet but considers the lake as “operationally full” at 1,219.6 feet elevation. The minimum water level to generate power at Hoover Dam is defined at 1,050 feet, below which the lake becomes an “inactive pool.” When water level goes down below 895 feet, the lowest water outlet at Hoover Dam, the lake is a “dead pool” as nothing would flow downstream from the Hoover Dam. Lake Mead's water level reached a record high of 1225 feet in the summer of 1983, and has been in steady declines since 2000. 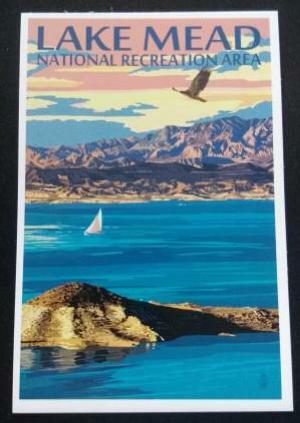 Lake Mead supplies water to 20 million people in California, Nevada, and Arizona. With the prospect of water levels dropping further, water managers in the above three states are under pressure to work out a plan to temporarily cut back water withdrawal from the lake. Postcard US-3482775 to New Jersey shows Lake Mead with 'bathtub rings' on its shores and islands, which indicate the devastating effects of water level declines.